The official blog of Charlesbridge Publishing. Come behind the scenes with us! I was born and grew up in a very small town in the west of Ireland. We were lucky to have a good library. I can't remember joining but I can't remember ever not being a member--so I guess I joined early! I certainly remember using the library a lot--we didn't have a bookshop in town (though I think I remember the toyshop did stock some Enid Blytons--my mother used to buy me one if I was good at the dentist!) so, even though my parents were teachers and readers, we didn't have that many books. By the time I was about 10, I had read every children's book in the library, some many times over, and the wonderful librarian, Mrs. Downey, suggested that if my mother approved, she would allow me to have an adult card. Surprisingly my mother said yes--probably knowing that Mrs. Downey would monitor everything I borrowed, which she did. But, in those days before teen and young adult publishing, the adult ticket provided an essential bridge to adult literature--and I did discover some wonderful adult writers like Liam O Flathairte who were perfectly accessible to a young reader. I also borrowed lots of craft books--I don't remember ever making anything, I just looked at the images and fantasised! Reading was such a joy for me--an escape, an inspiration, educational and challenging, mind-blowing and thought-provoking. It was no surprise that I went on to study English at university and to specialise in Children's Literature as part of my post-graduate teaching studies. 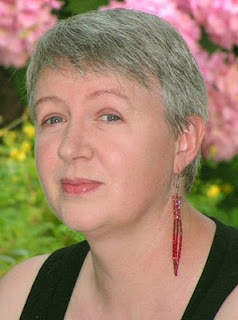 After spending a few years teaching, like so many of my peers in the 1980s, I left Ireland to find work and spent the next 14 years working in children's publishing--starting out as a desk editor, working up to being a publisher, and eventually starting my own small publishing list in 1998. After a very painful takeover and redundancy, I found myself working freelance doing a mix of consulting, writing, editing and project managing. I have a friend in Amsterdam who uses the expression 'red thread.' She says that a red thread connects all the little parts of your life--things that seem oddities while you're experiencing them often end up later to be significant steps on the way to somewhere else. Well, one of the things I did while I worked in publishing was some voluntary work for a group called the Working Group Against Racism in Children's Resources--how's that for a snappy title! It was made up of three groups--a book group, a toy group and a child development group (which looked at training materials for childcare workers and teachers). We met on Saturdays, developed training courses and materials we could offer to publishers, librarians and teachers; did training; reviewed books and published booklists and sets of criteria so professionals had guidelines pointing out things to look out for in order to both avoid selecting books which could offend or damage self esteem and to confidently select books which positively represented children from a range of backgrounds. The Book Group was made up of a wonderful range of librarians, writers, illustrators, photographers, reviewers, editors, publishers, teachers and parents from a huge range of backgrounds. I made some fabulous friends during the seven years I worked with the Group and, even after I'd left, often consulted with them when issues arose on books I was developing. Not long after I was made redundant, I was telling an old friend from this group (herself a librarian) about some work I was doing at a local school. She was surprised to hear I was working directly with children again after so long and asked if I would be interested in a position which had come up in her library. The position was that of Community Librarian with the government's Sure Start programme (which is similar to the US Head Start). The job would involve doing a lot of outreach work with disadvantaged families and encouraging them to come to the local library--where I was to set up rhyme times and family reading groups. I applied, went for an interview, and in April 2003 became Sure Start Acton's Community Librarian. Writing this, I can't believe how all the little bits of my life have come to connect--I think the red thread is one big knot now! I work three mornings a week for Sure Start--I don't need to do as much outreach now, so much of the time is spent running various groups in the library and other venues in the community. I read stories (many from books I've developed in the past), do crafts (all those ideas from my childhood must have been filed away somewhere) and sing nursery rhymes and songs. 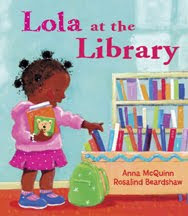 I find working directly with children in turn inspires my publishing work and I've been doing more and more writing, culminating last year with the publication of Lola at the Library--a pre-school picture book that is both inspired and made necessary by my library work. I come across mothers who've fled warzones or catastrophies or poverty and who have no experience of books being freely available for small children. 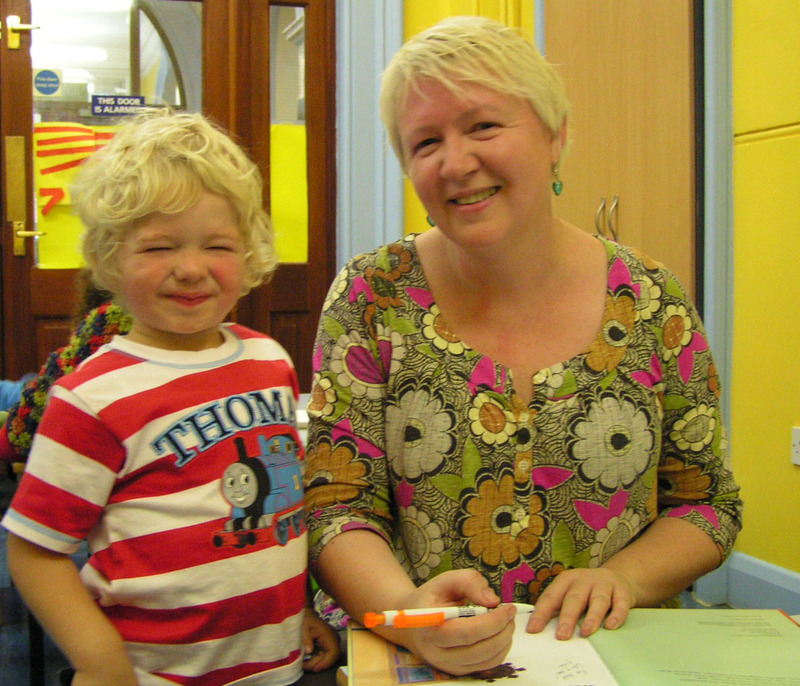 I have to work hard to persuade them that first of all, books are relevant to small children who don't yet read; then, to encourage them to take young children into the library and reassure them that they will be welcome. On the other side, I've had to work hard with my colleagues to identify and remove the barriers that parents face. It's not enough to put the multi-lingual 'welcome' poster on the wall and think that does the job. We've had to review our forms and expectations of what kind of ID it's reasonable to expect people to provide. For example, I recently heard a co-worker explain that she hadn't allowed a woman and her child to join the library on the grounds that "she couldn't be the child's mother--what mother doesn't even know her child's brithday?" Obviously, this worker did not understand that some mothers have children in situations where they don't know what day it is (they quickly learn to invent a birthday to suit the demands of bureaucracy). My experiences have taught me that some mothers don't know when they themselves were born. This is to say nothing of cultures that use a different calendar, making it difficult for people to work out a date of birth that fits our calendar. I could go on, but that would be boring--we all have individual stories and anecdotes we could share. All we can do is try to be alert and sensitive and do our best. 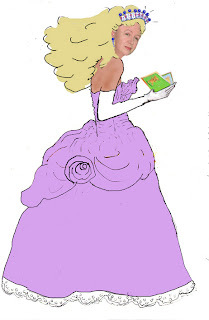 What I did decide to do was to write a story about a little girl who loves going to her local library. A picture is worth a thousand words, and this could not be more true in this instance--Rosalind Beardshaw has done THE most gorgeous illustrations and perfectly captures the little girl's enthusiasm. Now I use this book to do some of my work for me--it seems appropriate to have come full circle--everything for me begins and ends with a good book! As a former librarian and now a stay at home mother of a one year old I absolutely adore Lola! My daughter hands her copy of Lola at the library to me repeatedly through out the day for a quick "read". I've given Lola at the library as gifts and even let my local library know about her and of course she now graces the shelves there as well. 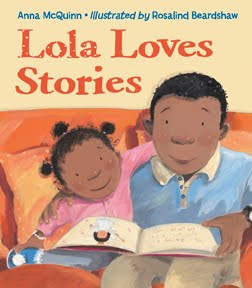 Any word on when Lola loves stories will publish in a board book edition? Wonderful blog post, Anna! I shared it with the whole retreat group from a few summers back. It was so good to meet you there. Did Galileo Really Have a Dog?